Should we stop throwing sticks for dogs? Throwing a stick for an excitable dog has to be one of life's great pleasures. Until you hear words such as "impaling" and "penetrative wound". This week, Grace Webster, branch president of the British Veterinary Association (BVA) in Scotland, told the Times that throwing sticks can be "dangerous and lead to horrific injuries", after a collie caught a stick that went through her tongue and damaged her larynx. So, should we stop? "Vets see some very serious, life-threatening and, in some cases, fatal injuries which have happened after a dog has chased a stick," says Sean Wensley, president of the BVA. There are two types of problems, he says: "One is where a stick is thrown and it lands in the ground like a javelin, pointing out. The dog chasing after it can't stop in time and runs on to the stick - we get some nasty penetrative wounds in the mouth, neck and sometimes the spinal cord, causing paralysis. Sometimes it punctures a major blood vessel and causes fatal blood loss. Then there are cases where fragments of stick get lodged in the mouth and throat. Because the wood itself is dirty, and the mouth is full of bacteria, it can set up a serious infection." Exercising and play is hugely beneficial for dogs and their owners, he says, but toys such as those made from rubber, or Frisbees, should be used instead of sticks. Runa Hanaghan, deputy veterinary director of the Dog's Trust, has also seen some nasty injuries, not all of them immediately obvious, as a result of throwing sticks for dogs. One dog had developed holes in its head after part of a stick had become trapped across its back molars and had eroded its hard palate. Another dog, belonging to a conscientious owner who was also a veterinary nurse, was discovered to have a splinter up the side of its tongue, which was only revealed under anaesthetic. An examination a couple of weeks earlier had failed to spot it, which goes to show how subtle stick-related injuries can be, she says. "I've seen injuries where it has been there for a long time because the dog has got used to it and nobody has noticed." 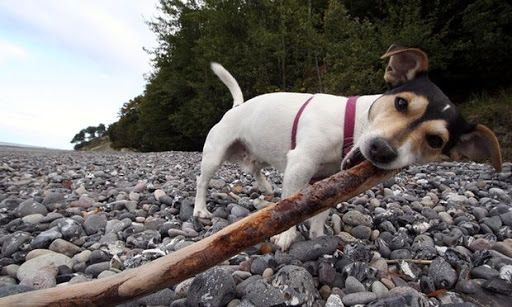 Dogs don't necessarily see sticks as toys - it's us who have taught them to play with them. "We would suggest training dogs to enjoy other toys; there are loads of things you can throw which are safer." Stan Rawlinson, a dog behaviourist, has been warning people off throwing sticks for their dogs for 20 years. He has seen some horrible injuries, including one dog who caught a stick that, spear-like, went straight through its head. He says it is possible to use training techniques to ensure your dog never picks up a stick on a walk again. "You can use four or five different techniques. The easiest is the 'off' command [training a dog to recognise when you want it to stop doing something by giving and withholding treats]." Alternatively, you could use something that creates a bang when it picks a stick up. This might get you some funny looks on a woodland walk, but "sticks are dangerous", he says, "and it's worth working on".